It is early springtime in Tonga. It was actually cool at times, and never unbearably hot (unlike when we were here last April). It rained or was overcast most of the time, but we were treated to blue skies on Monday for the closing Tongan Foursquare Convention event; an ocean baptism. We were given the privilege of assisting in the baptism of 4 young people who just gave their lives to Jesus. Tongans understand what it means to live in the presence of royalty. Tonga has a king. It is the only island nation in the South Pacific that retained the position of a royal monarch when the Europeans arrived. The people have high regard for their king, King Tupou VI, the younger brother of the recently deceased King Tupou V. Their culture is full of references to the kingdom, from ceremony to attire. The Tongan people are Polynesian (which is distinct from Melanesians of Southwest Oceania and the Micronesians of Northwest Oceania). Theirs is a matriarchal society, though kingship is help by male monarchs. There are 103,000 people who live on 52 of the 176 islands that make up the Kingdom of Tonga. Except for the royal family and a small elite, most of the people live in poverty. There is a fledgling tourism industry, but otherwise the islanders live by the sea and the produce of their ancestral farms. People live in family villages that go back many centuries. Even if you live in the capital city, you still consider your rural family village as your real home. Mandatory free education means that the majority of Tongans are well educated, so many of their young men and woman go overseas to find a way of earning a living and to send money back to their families here. There are an equal number of Tongans living abroad, mostly in the US, Australia, New Zealand and Canada, as there are here. The Tongan people love music. I don’t really know how to describe their singing other than to say it is like something from Heaven itself. They all seem to be born with an ability to blend their voices into the most amazing harmonies. Each time we would gather, it would begin with music, really beautiful music. Worship is typically at least an hour of any gathering. Jim and I have a simple assignment here. 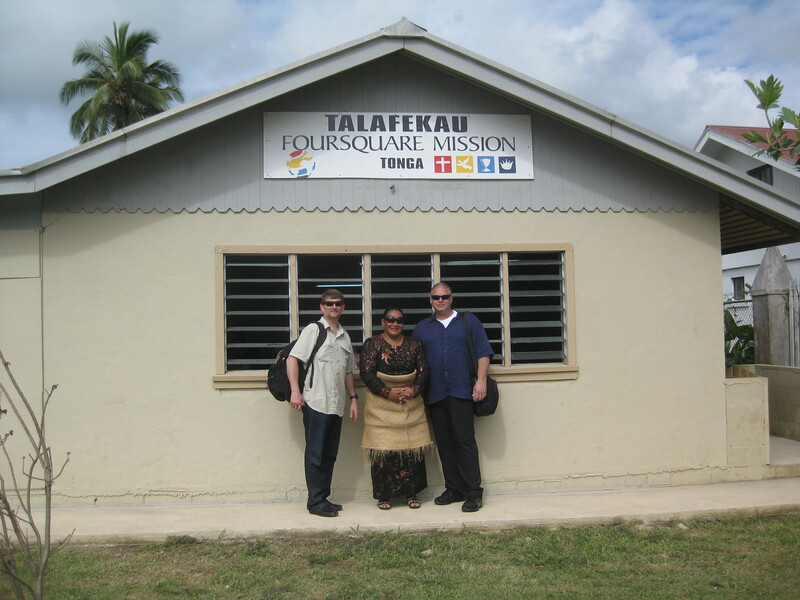 The Tongan Foursquare Church, like many of the churches in the South Pacific, is new. It is vibrant, spirit-led and growing. The Foursquare South Pacific Area Missionary, Jerry Stott, told us that he is spread too thin to give the attention and encouragement that the South Pacific national Foursquare leaders need. In order to help the mission efforts here, Beaverton Foursquare has adopted the island nations of Fiji, Tonga, Samoa, Kiribati and the Solomon Islands. We are here to teach and encourage the pastors and national leaders. We were in Tonga since Friday teaching about the Kingdom, about the role of the pastor/shepherd, about Foursquare’s doctrinal beliefs, about the Holy Spirit, about the ministry of forgiveness and reconciliation, and about the Word of God. Given his current work with youth, Jim Newby also spent quite a bit of time with the young Tongans and their leaders, teaching and encouraging them. While Tonga is considered a Christian nation, there has been little evidence of the ministry of the Holy Spirit here – though Foursquare is changing that. Sister Ilisapeta, the national leader, has brought excitement to the church in Tonga. She works with other churches, as well, inviting them to participate in the fullness of God. In addition to her own congregation, pastors from other churches are frequent participants in Foursquare services and worship nights. They know that something special is happening here and it they want to be a part of it. I said that every time we would gather we would begin with song. And frequently, we would end with food. On the first day we taught, they laid out a feast for a king. Fresh lobster, crab, oysters and shrimp from the ocean. Full pigs on every table. Vegetables and fruit that were both familiar and unfamiliar. The people of Tonga have been gracious hosts and have extended themselves in every way to make us feel welcome. God put us in Tonga so he could put a little Tonga in us. On Sunday morning, I spoke a message about forgiveness. I spoke about the power of reconciliation to make way for the greater works of the Holy Spirit. I shared a personal testimony about how in my early Christian walk the Lord had me reconcile with my sister, who I hadn’t spoken to in years. It touched a lot of people with their own stories of family brokenness. That night, people from all over were invited to a night of worship and prayer. Men and women who had been at the morning service came to tell me about the commitments they had made that morning to seek out family and friends from whom they were estranged and to reconcile. Now that is a move of the Spirit! The church in Tonga sends greetings and thanks to the church in Beaverton. Malo Leilei. This entry was posted in Missions, South Pacific, Tonga by marknicklas. Bookmark the permalink.